Today is Monday and in my quest to make Monday’s as positive and cheerful as possible I thought I’d write about some of things that make me smile at the moment, the songs, food, events, etc that make me go “you know what, life is good”…. Mr Dave has been listening to a LOT of Queen recently, and for his birthday I got him the first 2 best of albums, we were listening to the first one this weekend in the car and I’ve had “Fat Bottomed Girls” in my head pretty much ever since. I was pleased as punch for Adele that she cleaned up at the Grammy’s this week. I think the girl has an amazing voice and I have a lot of emotional attachment to her voice – we had “Make You Feel My Love” at my Aunt’s funeral at the beginning of this year and I can’t hear it, or even really think about it, without getting a lump in my throat. However, I generally find Adele’s music beautiful and haunting, today I’ve got “Rolling in the Deep” from her Grammy’s performance fighting for space with “Fat Bottomed Girls” – Head Radio at it’s best! I’ve got a real thing about Spy drama, and when I saw an ad for this show I couldn’t wait to watch it! We recorded it and never really got round to watching it, but with both of us feeling under the weather this weekend we made a start, and ended up watching the majority of the first series! Piper Perabo is the star, she played the lead in “Coyote Ugly”, and she is a new CIA agent, it follows her through the ups and downs of her work, and living with her sister and all that that throws up. It’s really a great show! Oh, this stuff is heavenly, so light and beautiful. I got quite a lot of stuff for my birthday, so I’m even more in love with it than usual. It just makes me smile to smell so lovely. And when I catch a whiff of myself it makes me smile too! Another birthday favourite. My friend got me a gorgeous set and wow, when I use both my hands smell amazing, and the Hand Food cream is perfect, so silky smooth and yummy! Currently my go to food for comfort and yummyness, scrambled eggs on a bagel with ham. NOM! So, what is making you smile at the moment? I prefer “Bicycle Race” to “Fat bottomed girls” at the moment! Queen – has to be Somebody To Love or Seven Seas of Rhye for me. 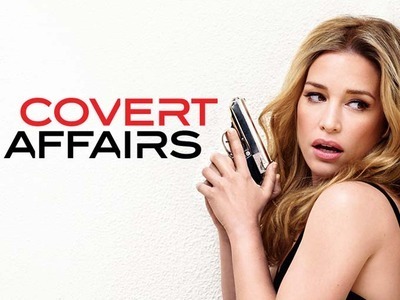 Covert Affairs – love this show but really want to see something happen between Auggie and Annie – then again would it change the dynamic if something did actually happen?? ?